We dropped anchor in Prickly Bay, a bay chock full of boats (mostly sailing) of every shape and size. After a quick lunch and a wifi fix we headed up to Little Blue, the villa my parents had rented for the week. Wow, what a lovely spot. 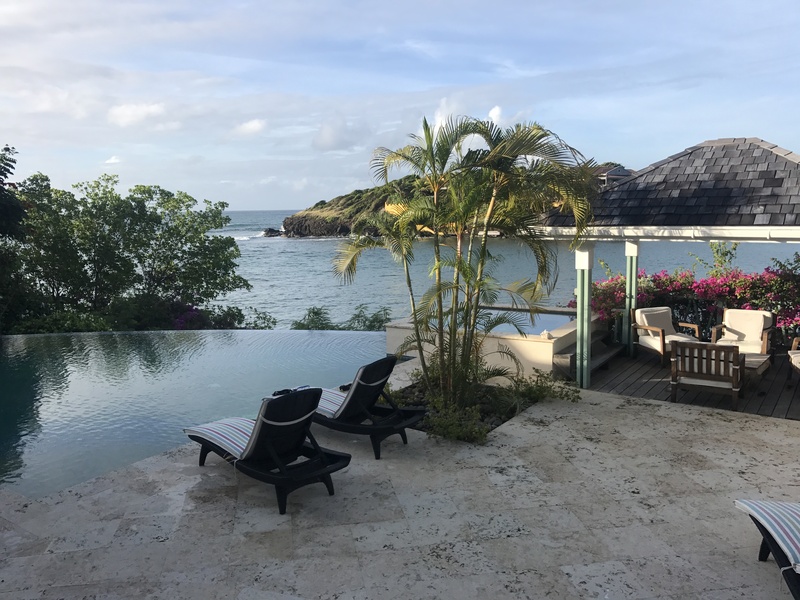 High ceilings, an enormous open kitchen, several terraces and a lovely big infinity pool with a view over lush palms and bougainvilleas tumbling down to the charming cove where kayaks stood ready for exploration. 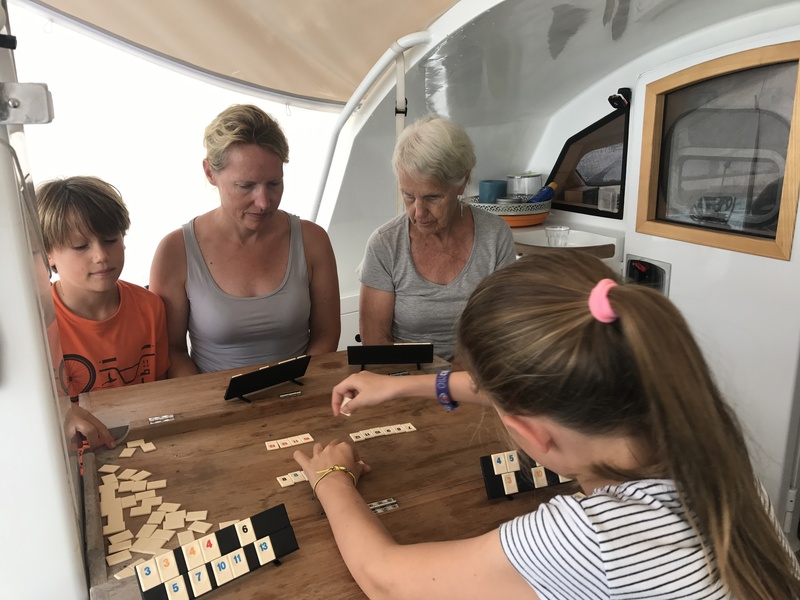 Nana and Dadcu arrived and we settled into a wonderful week of relaxation, comfort, delicious meals, swimming pool swims and cosy chats and catch ups. We also took advantage of the house to take the boat out of the water for some new bottom paint. 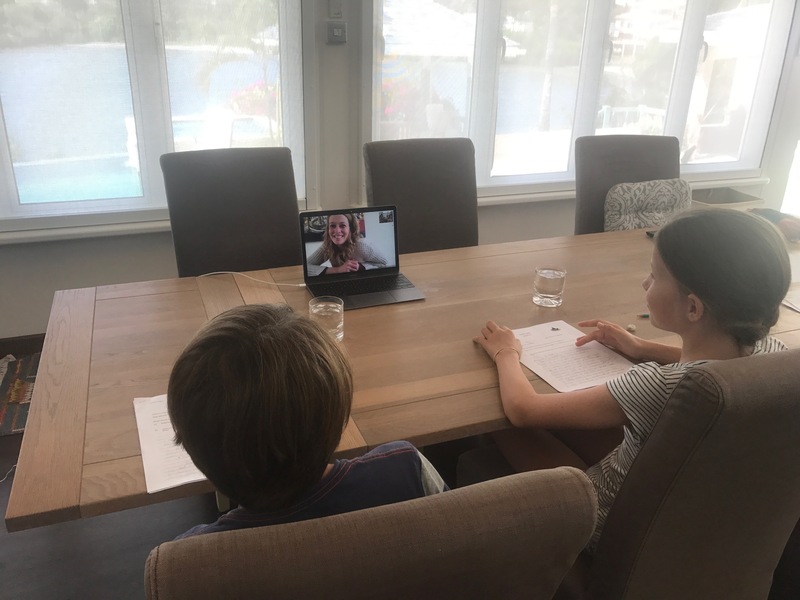 The monkies spent 2 full mornings on a Skype call with Marieke, a great teacher from the Europaschool, who agreed to administer the admission tests for the school that we hope that they can attend in Halifax. The tests were very intensive (math, logic, grammar and creative writing) and all in English. They have only had 3 months of formal English learning so it was tough but they took it well and we all felt some relief when it was over. After a blissful week we left Little Blue and moved with the 6 of us back onto the Dutch. 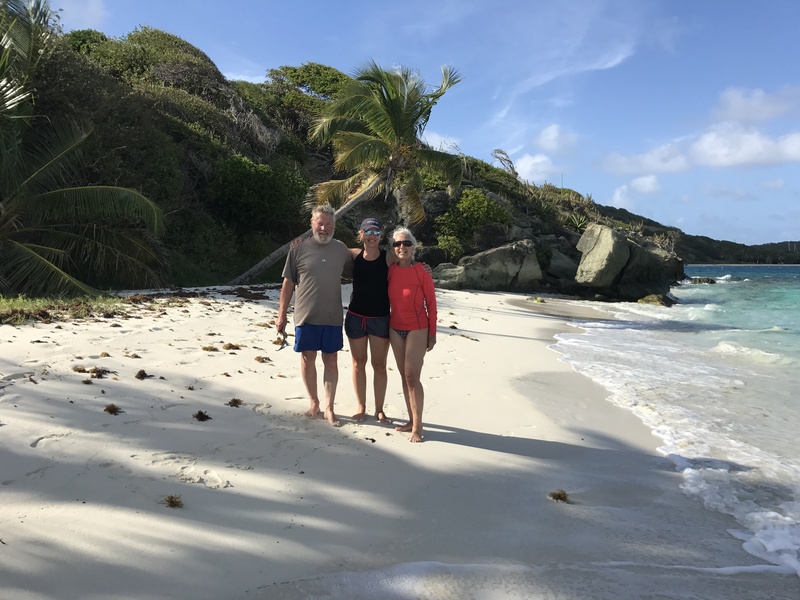 We had a loose plan for the coming 10 days to island hop slowly up to and through St. Vincent and the Grenadines to reach St. Vincent by February 1st. And this we did, changing our plans from time to time due to heavy winds or a wish for a longer stay in a nice anchorage. 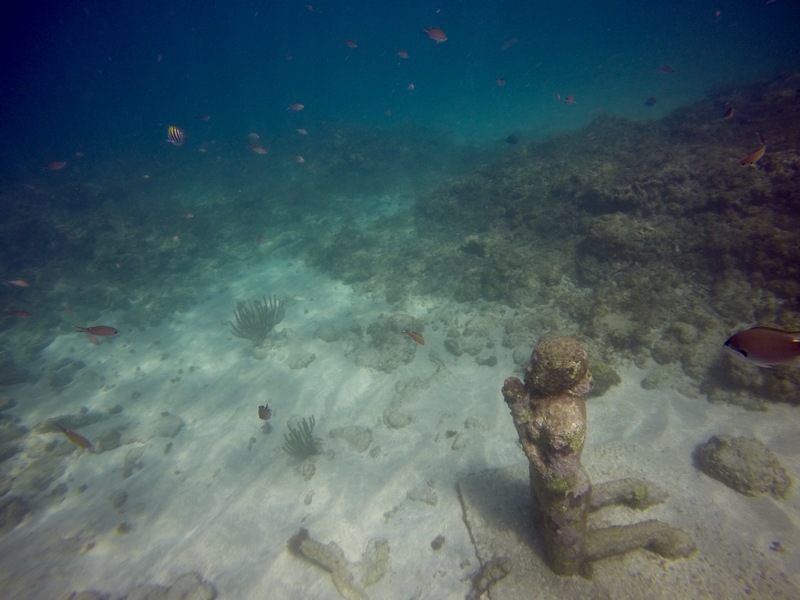 A lovely snorkel close to Dragon’s Bay on Grenada at the Molinere Underwater Sculpture Park, viewing the eerily beautiful concrete and rebar sculptures between 4-8 meters underwater. 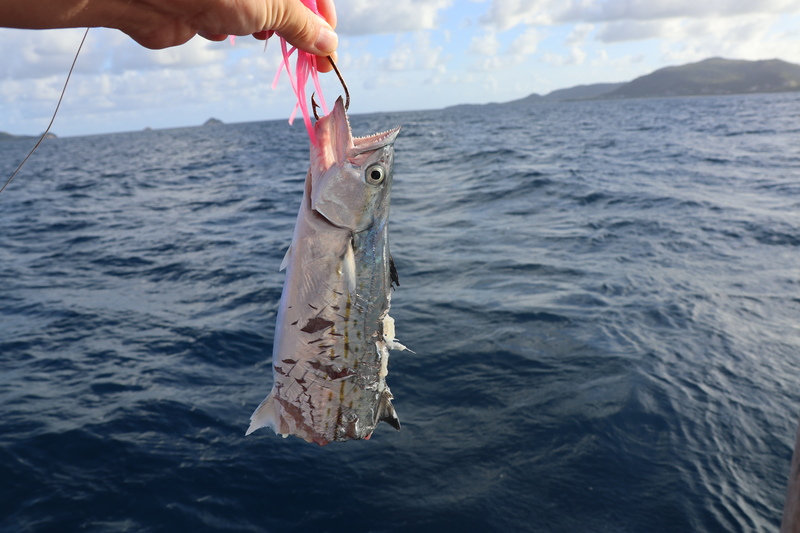 From here, on the way to Union Island we hung out the fishing line, heard the anticipated zzzzing of the line only to pull in ½ a Spanish mackerel, the other half had been bitten off by a faster/ fiercer predator while we were reeling it in. That said, the relatively small morsel that we were granted was mighty tasty. 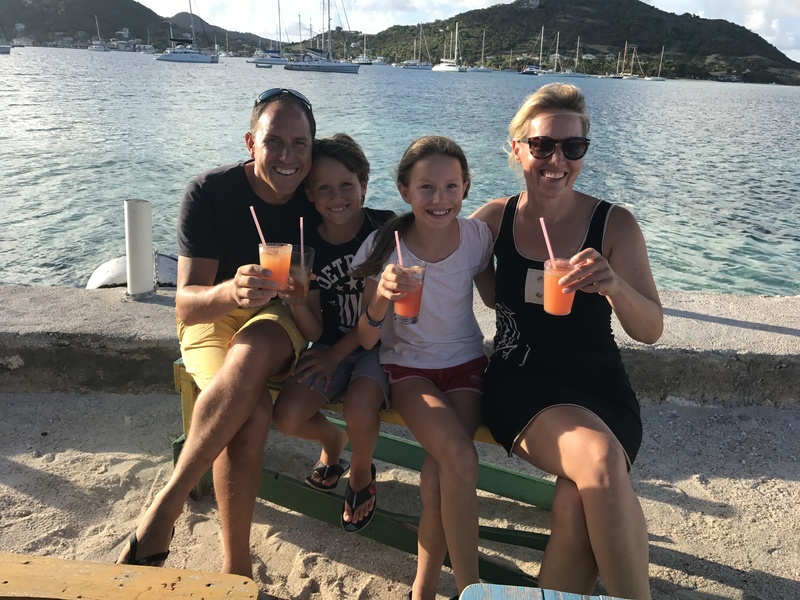 Union Island is full of ‘ boat boys’ who come knocking on the boat in fast boats with fancy names at all hours of the day offering goods and services. I applaud the initiative but the frequency and persistence does get annoying and ruins your trust for the odd boater that comes along and doesn’t want to sell you something. In a shamefully naïve action on my part I miscalculated the exchange rate and ordered a banana bread from one of these guys. Great service, the bread was delivered at 0730 the next morning…it was tasty but it cost about 9 euros!!! 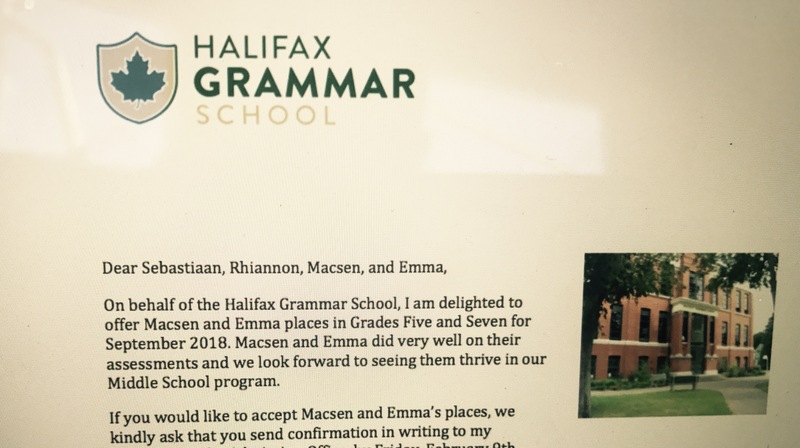 And then excellent news…just as we were about to head over to Happy Island (a lovely little island created out of empty conch shells with a little bar on it) for a rum punch, I received an email from the Halifax Grammar School congratulating us on Emma and Macsen’s acceptance in their program. Apparently they both did very well on their exams. Super! That rum punch tasted particularly good. This is a weird year on the Atlantic ocean weather-wise…everybody is saying it. And we feel it, rain, rain and lots and lots of wind. We had a really wonderful trip up through the islands but indeed the wind and weather did not work with us. Our dinghy trips were often alarming with huge waves and somewhat wobbly beach landings. 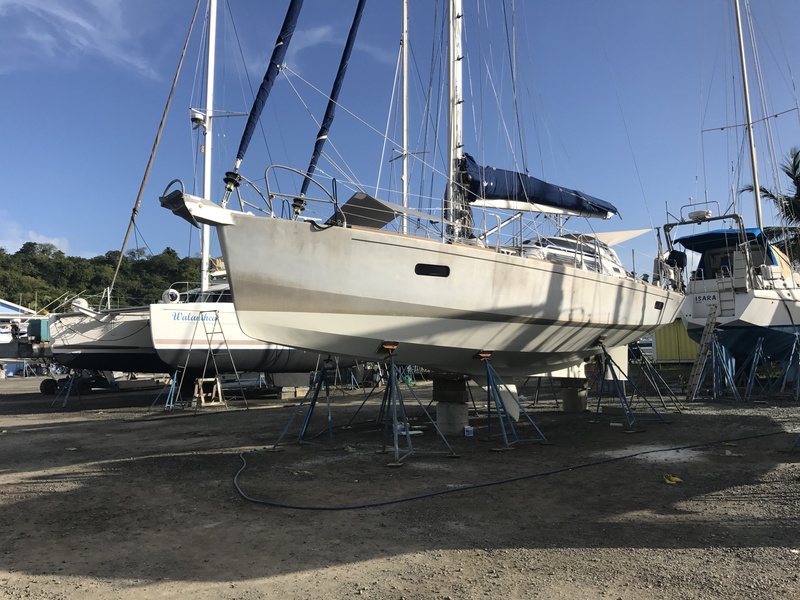 Getting into and out of the dinghy and on an off the boat for a swim was really taking your life in your hands and trusting that you would land inside the boat and on a relatively soft spot…ideally not the fleshy bits of a fellow passenger. The dinghy flopping up and down on huge and steep waves and the Dutch also bucking kept this an interesting challenge. Island hopping was always up-wind and brought us into squally weather, with winds up to 43 knots!!! and waves to match. Not a comfortable ride. 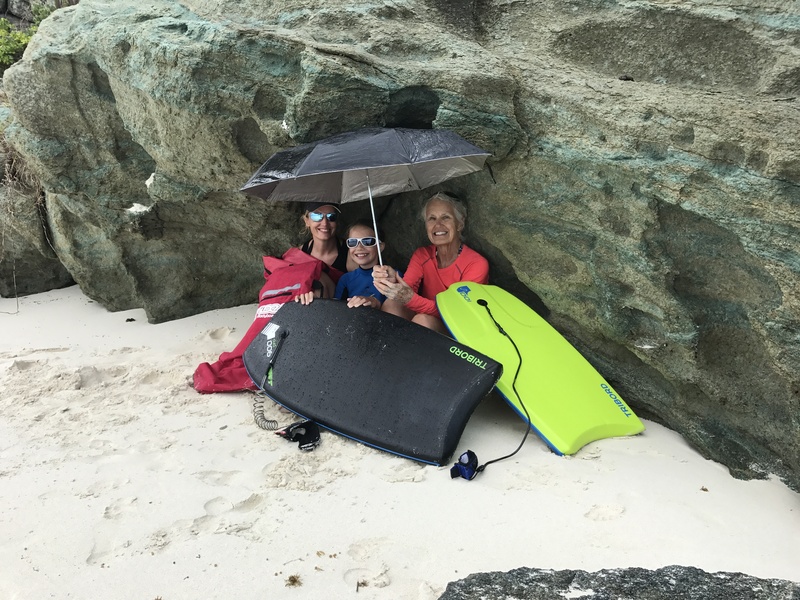 So Nana and Dadcu’s Caribbean visit was extremely rough but they didn’t complain and were game for everything that the conditions threw at us. And we really had a lovely time, easy and fun to travel together. Amazing, wonderful trip! Save sailings!